I’m going to be honest with you. If there was an Olympic event for feelings of insecurity, inferiority, and inadequacy, at some point my picture would have been on the Corn Flakes cereal box…the gold medal winner. Now, you probably think I’m going to tell you, “But then I became a Christian and all that insecurity just went away!” But it didn’t. I did become a Christian when I was fourteen. That part is correct. However, I carried that insecurity into my Christian life like a ball and chain wrapped around my skinny ankle. Don’t get me wrong, I could sing “Victory in Jesus” with the best of them. I knew without a shadow of a doubt that when I left this earth and crossed over the threshold into my heavenly home, I was going to be with Jesus forever. It was what I was supposed to do until I got there that had me stumped. It was victory in this life that left me confused. Did you know that you can be a bona-fide born-again Christian and still live a life of defeat? Yes, you can. But if you do, ifI do, it’s not God’s fault. He has given us everything we need for a life of godliness through our knowledge of Him who called us by His own glory and goodness (2 Peter 1:3). He has equipped us with the power of the Holy Spirit (John 14:20), the mind of Christ (1 Corinthians 2:16), and the precious promises that never fail (2 Peter 1:4). But it’s up to us to walk in the truth of who He is and who we are in Him. It is up to us to walk in victory as “more than conquerors” in Christ Jesus (Romans 8:37). Moses had to deal with the same insecurities that you and I have to grapple with. He was a former Prince of Egypt who became a run-away felon. For the next forty years, Moses took care of his father-in-law’s sheep in the Midian desert. When he was eighty-years-old, God spoke to Moses through the burning bush. “So now, go. I am sending you to Pharaoh to bring my people the Israelites out of Egypt,” (Exodus 3:10). Hold the phone! You’re sending who? It wasn’t too long into their journey to the Promised Land, when they were attacked by the Amalekites, a godless people who had taunted God’s chosen people for centuries. But because of God’s intervention, the Israelites won the battle and Moses built an altar and called it “The Lord is my Banner [Yahweh Nissi]” (Exodus 17:10-13, 15). The banner was a symbol of victory! It still is today. This is the only time in Scripture that God is referred to as God our Banner, but it was not the only time God won the victory for His people. Time and time again, God fought for His people and they waved the flag of victory in the face of apparent defeat (Joshua 10:10, 20, 33; 11:8, Judges 11:21; 20:35). He made the waters rise, the walls fall, and the earth stand still. Yes, God fought for His people, and friend, He will do the same for me and for you. Have you ever tried to talk tried to talk God out of using you? I bet you have. Why do you think we try to talk God out of using us? Share you answer on my Facebook page and let’s compare notes. 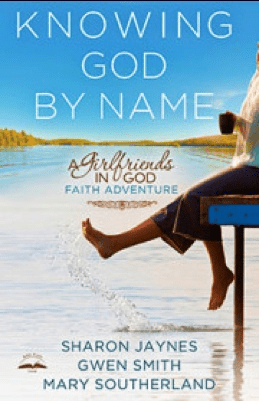 Today’s devotion was adapted from our new Girlfriends in God book, Knowing God by Name Throughout Scripture, God reveals His complex character by identifying Himself by different names—names that shed light on who He is and how we should relate to Him. We invite you to join us in Knowing God by Name as we take an in-depth look at 40 different names that shed light on 40 different reasons you can trust Him, depend on Him, and know that He loves you. Click here to learn more and download a free sample chapter.